I copied my last year’s experiment with pomegranate rind on cotton yarn (bottom), and added bicarb to the liquor. The result was a light mustard-yellow. As the rind was a mixture of yellow and red, I decided to try again with red-only rind (the pomegranate was red all over, as the ones imported from the US tend to be), and added (I think…) ammonia to the liquor. You couldn’t see through the j ar when held up to the light, and the yarn (top) – c.12g – came out a grey-mauve after washing. Still not a very deep shade, but it demonstrates the variety that can be obtained from the fruit. As the dye liquor was still dark, another skein of cotton went in, but this time came out a “dirty yellow”. None of the skeins had any mordant, so this plus some modifiers might be the subjects of the next experiments. I’ve been saving avocado pits and skins for a number of months, but the contribution from a colleague (thanks, Rhonda!) far outweighed – literally – the amount that I got through over the summer. The pits were halved, sliced, then either dried or frozen; the skins were ripped into smaller piece, then dried. The dye liquor was made by soaking the relevant parts in water, then adding either bicarb or ammonia, then steeping the cotton yarn in this for a few days. The photo, as always, doesn’t really show the true colours, especially as we’re in autumn and the sky is overcast, but the bottom row were all attained by adding bicarb to draw out the red. The yarns all turned out various depths of pale pink. With the two on top, the left was from 20g dried skins (purple ones) soaked for a few days, then for a few days more with ammonia, then a few more again with the yarn. In real life, it’s slightly darker. The one on the right was from 100g frozen, sliced pits following the same method above. The ammonia definitely brings out a deeper shade. Now, what to do with with five balls of cotton in antique pink? Actually, I’ve thought of one use, but that’ll have to wait. I finally got to the end of a bag of cotton roving that had been sitting in the cupboard, waiting to be s pun. Perhaps it was waiting the arrival of the penny tahkli? I wanted to get some slubbiness to the yarn, so left lumps and bumps in it at regular intervals. The trouble is, more practice = less character to the yarn. 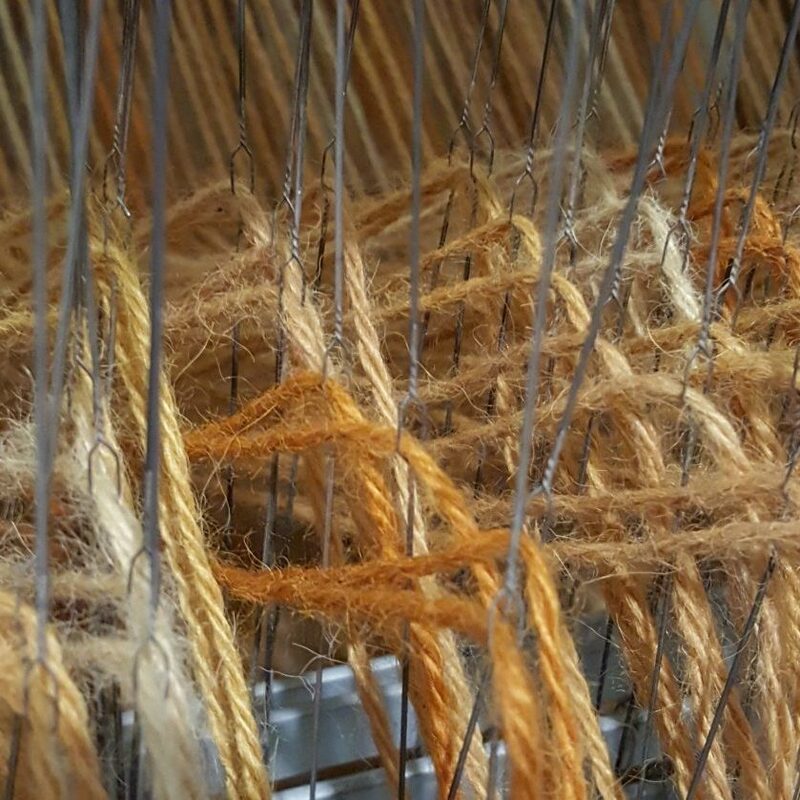 During a recent alpaca spinning workshop at the Guild, I quoted the English comedian Les Dawson and his signature act of playing the piano with carefully placed “wrong” notes. He explained during an interview that you had to be good at playing the piano before you could be intentionally bad. In spinning terms, I guess that explains the difference between a beginner’s yarn and an art yarn. Nevertheless, yours truly shall continue to practise being intentionally bad. As you can see, I spun as much cotton as would fit on the tahkli. Just the “feel” of it told me that any more fibre wasn’t an option as the spinning slowed and became more “cumbersome”. Then, this weekend just passed, I found an olive bowl – just the right width and length to accommodate the tahkli in resting mode. Where does all the red go from the peel? Having been more successful with the betel nuts after an alkaline soak, I decided to try with pomegranates. A colleague had supplied me with heaps of peel, which were then dried off in the food drier; it’s getting coole r and damp at the moment, so I wanted to avoid the harvest going mouldy. A jam jar was filled to about a third of the way up with dried peel broken into small pieces, then water was added to within an inch from the top (to allow for bubbling, etc.) and then a good spoonful of bicarb. The colour came out shyly over the first few hours, but after a whil e and with a bit of stirring….. treacle. What with a host of other projects on the go, I actually forgot about this for a day, and couldn’t do anything until the third day anyway. A small skein of scoured cotton was added to liquor in a larger jar and left for a day (or two?). For the sake of speed, I gave the skein a wash in laundry powder (which made it go darker at first), then rinsed until clear. You can see that it produced quite an acceptable colour. I didn’t want to leave wool soaking for so long in the liquor – pH10 – but then tossed between an alkaline soak and an alkaline boil and which would be the most damaging. Boil it was – for about twenty minutes. The colour isn’t all that bad, but the damage caused doesn’t really make the risk worthwhile. Maybe like a home perm.